Anonymous sale; Christie's, London, 13 November 1987, lot 320, where purchased by the present owner. London, Lefevre Gallery, Recent Paintings by L.S. Lowry, June - July 1964, no. 11. 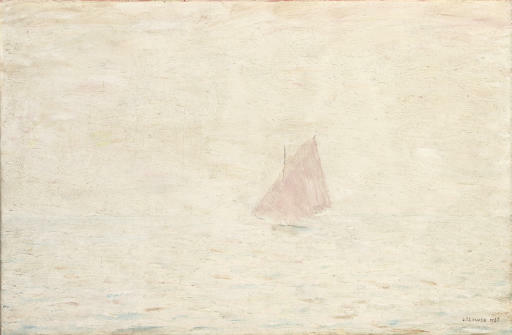 Lowry's earliest known drawings were of boats off-shore and this was an image that fascinated him through out his long career. The intensity and majestic power of the sea that held the artist in such awe, is here humanised by the presence of a single yacht. Motifs in their own right, the yachts that Lowry depicted were a source of visual effect and contrast, their sails breaking the relentless continuity of the sky and the sea. Michael Howard (Lowry: A Visionary Artist, Salford, 2000, p. 227) remarks, 'However much Lowry may or may not have exaggerated or romanticised certain aspects of his life, the significance of the sea in his life and work cannot be doubted; as with so many motifs that attracted the artist, it took hold of his imagination in early life. Its presence was a subtle but dominant feature of his emotional and physical existence, and he used it in his work as a significant metaphor'.